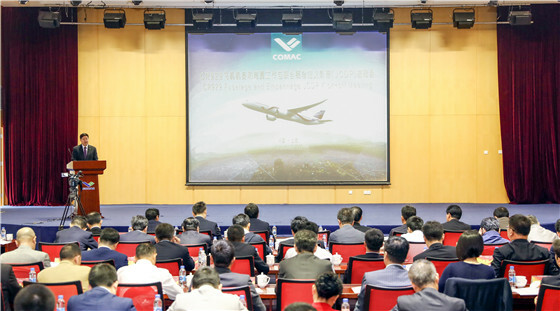 COMAC kicks off CR929 fuselage and empennage JCDP comprehensively__Commercial Aircraft Corporation of China, Ltd.
Commercial Aircraft Corporation of China, Ltd. (COMAC) held a CR929 Fuselage and Empennage JCDP Kick-Off Meeting on April 27th, 2018 and comprehensively started the Joint Concept Definition Phase (JCDP) of CR929 fuselage and empennage with potential suppliers. Mr. Guo Bozhi, Vice President of COMAC and President of China-Russia Commercial Aircraft International Co., Ltd (CRAIC), attended the kick-off meeting and made a speech. Representatives from Shanghai Municipal Commission of Economy and Informatization, Offices of Science, Technology and Industry of National Defense of relevant provinces and cities in China, Aviation Industry Corporation of China (AVIC), China Aerospace Science and Industry Corporation (CASIC) as well as 27 domestic and foreign suppliers of airframe structure and raw materials attended the meeting. Mr. Guo Bozhi said in his speech that JCDP of CR929 fuselage and empennage work packages would focus on the design requirements of various aspects, and make a comprehensive tradeoff to realize the global optimum of technical schemes. The selection of airframe structure suppliers would inherit and carry forward the mode of "Main Manufacturer - Supplier" and the cooperation position of "Risk Sharing and Benefit Sharing" to actively promote cooperation at home and abroad. He hoped that the potential suppliers and the CR929 program team of COMAC could unite in good faith and bring the best technology and the best practices to CR929 program. He also hoped that all parties concerned could continue to give strong support to COMAC and CR929 program and continue to give strong support to suppliers. It is learned from the meeting that the joint team of the Chinese side and the Russian side is working on the overall technical scheme of the aircraft; composite materials will be widely used in the airframe structure of CR929 aircraft; and COMAC has invited relevant domestic and foreign potential suppliers to participate in the design of the scheme in order to accelerate the research and development of "Design and Manufacturing Integration" of CR929 fuselage and empennage. It is reported that COMAC has been working closely with its partner, United Aircraft Corporation (UAC), to promote the research and development of CR929 long range wide body commercial aircraft. According to the work share agreed by both sides on the research and development of airframe structure, COMAC will undertake the development of fuselage and empennage work packages. Both sides have been pushing ahead with the development of their respective aircraft structure work packages. CRAIC, the implementer of CR929 program, united COMAC and UAC to start the work on the JCDP of CR929 engine and airborne systems, organized the potential suppliers to carry out the design and selection of schemes, and steadily carried out the selection of the airborne system suppliers on March 22nd, 2018.